SAN FRANCISCO, CA -- (Marketwire) -- 09/29/08 -- The introduction of the iPhone and Android are changing the way consumers view and use their mobile phones, and driving widespread adoption of mobile applications. Measuring the performance of these applications and ensuring a positive user experience will be critical to solidifying mobile apps' immediate success and enabling mobile developers to improve their products, retain customers and grow their business. To meet this need, Flurry is launching Flurry Analytics, the first free, cross-platform service to provide developers with detailed analytics about how, when, where and by whom their mobile applications are being used. The mobile app market was relatively under the radar until the launch of the iPhone and App Store, with the App Store seeing 60 million downloads in its first 30 days. As the App Store and Android Market pave the way for the cell phone to transition to a true mobile computing device, delivering quality apps will be essential to widespread consumer adoption. "The mobile phone is evolving, but without detailed information on how consumers are responding and using new applications, it's a real challenge for developers to make strategic product decisions that grow their businesses effectively," said Simon Khalaf, president and CEO of Flurry. "Developers have to know what's working, pinpoint what's not and respond rapidly -- that will be key in fueling the growth of mobile applications. That's why we've developed Flurry Analytics as a free service to arm developers with the in-depth information they need to build better, smarter applications." What's unique about Flurry Analytics is that it provides free analysis of applications for the iPhone and Android as well as all phones running on Java ME (J2ME). While iPhone and Android are the likely drivers of mobile app adoption in the short-term -- and Flurry's analytics put it in the unique position to see past the download numbers to how successful mobile apps really are on each platform -- the trickle-down effect is what will launch mobile apps onto smart phones with higher market penetration. J2ME fuels more than 1,200 different handsets worldwide, so the platform represents a significant opportunity for developers to significantly increase the reach of their applications to more users. "Our cross-platform approach connects app developers with consumers, not devices, giving developers the greatest opportunity to successfully expand their footprint in the mobile market," added Khalaf. As leading app developers, Flurry is in the unique position of understanding exactly what developers need -- Flurry Analytics was born out of Flurry's desire to fill the analytics void it experienced when sending its own Flurrymail and Flurryfeed applications into the mobile abyss. With Flurry Analytics, Flurry was able to improve its apps for its more than 3 million users, and is now making that analytics service available to third-party developers. Flurry Analytics lets developers focus on doing what they do best -- create the latest and greatest mobile apps for consumers. That's why Flurry Analytics requires minimal engineering integration and occupies a negligible amount of space in an app. It provides accurate, real-time information about how consumers use applications, giving developers valuable insight into how their applications behave and helping them identify issues and opportunities. The knowledge gained from Flurry's reporting and analysis helps developers satisfy user needs, increase satisfaction and retention, save money and grow revenue. Flurry will continue to incorporate value-added services and revenue-generating opportunities in the coming months, but Flurry Analytics will always be offered to developers for free. 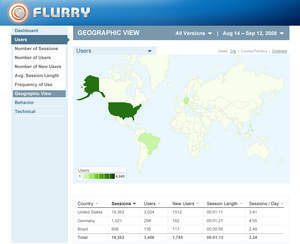 The Flurry Analytics service will be available to application developers beginning October 6. For more information on joining Flurry's private beta program, please visit www.flurry.com. 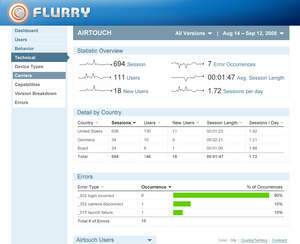 Flurry Analytics is a free service by Flurry. It gives application developers real-time, in-depth information about how consumers use their mobile applications. By placing a lightweight agent into an application, user actions within the application are tracked, logged and reported back in aggregate for analysis. Application developers get valuable insight into how their applications behave, and Flurry's robust reporting and analysis tools help pinpoint issues and identify opportunities. The knowledge gained from Flurry Analytics helps developers satisfy user needs, increase satisfaction and retention, save money and grow revenue. Flurry offers cutting-edge analytics, deployment and monetization tools for mobile application developers. Its services platform is offered free to application developers allowing them to better save money, increase revenues and improve their products. Flurry's platform is built by developers and for developers. The company was the first to develop and market direct-to-consumer applications and leveraged its expertise to build its services platform. Flurry is venture-backed and is based in San Francisco.